We’d love your help. 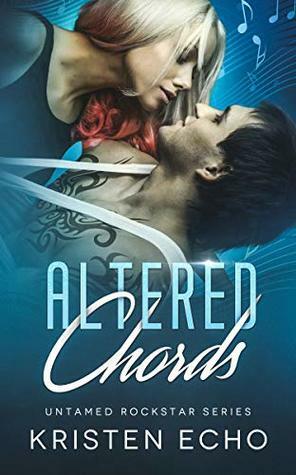 Let us know what’s wrong with this preview of Altered Chords by Kristen Echo. Opposites collide, pushing the boundaries of summer love. Tyson joined the Altered Chords tour to escape his messy life. Spending the summer as the band’s roadie is the perfect distraction for a broken-hearted, newly paroled convict. Then Bria came along like a firecracker, exploding light into his darkness. He’s the badass, but she’s trouble and she needs his help. There’ Opposites collide, pushing the boundaries of summer love. Then Bria came along like a firecracker, exploding light into his darkness. He’s the badass, but she’s trouble and she needs his help. There’s nothing he won’t do to protect her and the band, even if it ends with him behind bars. Bria’s sick of hiding, and a trip to the mountains is exactly what she needs to flee her problems. One look at the tall, dark, tattooed stranger, and she’s hooked. He’s rough around the edges, and his touch ignites a passion she can’t ignore. She’s willing to risk it all for a second chance at love, but when her ex-boyfriend finds them, all hell breaks loose. To ask other readers questions about Altered Chords, please sign up. Kristen has done it again! After finishing up her Puck Battle series, I didn't think her writing could get any better, but she has blown me away! Altered Chords was raw, real, & emotional on all levels. Bria is tired of living the life she has been for the past few months, basically being a prisoner in her own home because of her ex-boyfriend. She decides a trip with friends is what she needs. When she heads out for the weekend the last thing she expects is to meet Tyson; a guy who is her co Kristen has done it again! After finishing up her Puck Battle series, I didn't think her writing could get any better, but she has blown me away! Altered Chords was raw, real, & emotional on all levels. Bria is tired of living the life she has been for the past few months, basically being a prisoner in her own home because of her ex-boyfriend. She decides a trip with friends is what she needs. When she heads out for the weekend the last thing she expects is to meet Tyson; a guy who is her complete opposite. Where she is spoiled and comes from a ton of wealth, Tyson has had to work for everything he has. When they meet, sparks fly & they cant get enough of each other. But when Bria's ex walks back into the picture, he causes a whole bunch of havoc that Bria may not be able to get out of. Will Tyson be her knight in shining armour or will the ex get the girl back?? This book is the beginning of yet another great series by Kristen Echo. Tyson wants to stay away from his family, which hurt him too much, so he leaves to be roadie of the band Altered Chords. Bria is hiding from her ex, who stole millions from her, and is waiting for the court's decision to arrest him, but when she begins to get impatient to be locked, her parents authorize her to go out with some friends for a long weekend. When Bria and Tyson meet, the attraction is instantaneous, but both have This book is the beginning of yet another great series by Kristen Echo. When Bria and Tyson meet, the attraction is instantaneous, but both have problems in their past and need to solve everything to be able to stay together. Will they be able to overcome the reappearance of Bria's ex? Another winner by Kristen Echo. This starts a new series. Bria has been hiding out from her ex and has been holed up at her parents house. She’s close to a resolution but hasn’t told her friends the real story. But a girls trip is just what she needs. Tyson is a roadie for Altered Chords, a band, and he’s tall, tattooed and a bad boy. He’s the exact opposite of her ex. Instant attraction and off the charts chemistry make this fast and easy read a winner. Looking forward to future books in this ser Another winner by Kristen Echo. This starts a new series. Bria has been hiding out from her ex and has been holed up at her parents house. She’s close to a resolution but hasn’t told her friends the real story. But a girls trip is just what she needs. A really good beginning for a series of rock musicians. This was a little bit more raunchy than I expected, but then they are young musicians. A really good story about a girl ditching an ex and her friends not understanding why and giving her a hard time about it. She meets a rough looking roady and they really hit it off. Lots of heat, with a great story, a little bit of suspense with a very good HEA. I can't wait to read the next one in the series.....5 stars for me !! This book is great. It has the great story line that is expected from Kristen Echos books. The scenes between Bria and Tyson, who are from 2 different worlds are so hot and intense. This is definitely worth the read. I love Kristen Echo and her books. I voluntarily reviewed an ARC of this book.